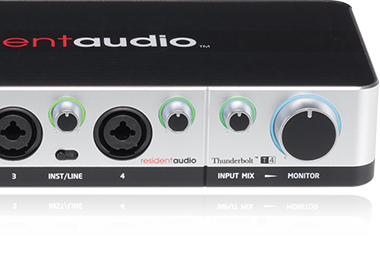 The Resident Audio T4 is the first ever four-channel Thunderbolt™ audio interface which requires no external power—a breakthrough in the worlds of live performance and recording. It adds four channels of I/O to Thunderbolt-equipped Mac and Windows computers*, with support for high-resolution 24-bit/96kHz audio and near-zero latency for virtually instantaneous recording and playback. The lightweight and portable T4 comes with all required software drivers and a ton of innovative features such as an auto-detecting Multichannel Output Mode and Smart Monitoring, which automatically switches between stereo and mono depending upon input configuration. Four combo XLR / ¼" input jacks allow you to plug in microphones, instruments and line-level devices— with phantom power for all inputs—and there are four balanced TRS outputs for connection to speakers and external mixers. MIDI connectors enable the T4 to be used as an ultra-stable MIDI interface, and there are even dual headphone outputs. Tilted tactile gain controls with three-color wraparound LEDs allow you to quickly set optimal levels, even in low-light onstage environments. Whether you’re in the studio, on the stage or in the DJ booth, the T4 provides the perfect interface between your computer and your performance. * Select Windows systems only. Click here for an up to date list of compatible Windows computers. Developed by Intel Labs in collaboration with Apple, Thunderbolt is the most advanced input/output (I/O) protocol available today. Twice as fast as USB 3.0, twenty times faster than USB 2.0 and twelve times faster than Firewire 800, it provides unparalleled audio performance with near-zero latency. For more information about Thunderbolt, click here. The T4 offers a number of features that make recording and live performance easy. These include a "Big Knob" master volume control; an Input Mix control for blending live signal with computer playback; Smart Monitoring, which allows you to easily switch between stereo and mono monitoring; and two different modes of operation: Stereo Mix mode, optimized for the studio, and Multichannel mode, perfect for live performance. The T4 allows you to record and play back audio with awesome sound quality. Unlike USB devices (which can only carry a maximum of 2.5 watts of bus power), Thunderbolt allows for a full 10 watts of power to be carried over the same wire as the audio signal. This allows us to use higher quality components in the T4, such as custom designed analog preamps (the T4 has eight of them—two for each channel) and high-power A/D/A converters. Setting up the T4 is fast and easy. It comes with everything you need: a Thunderbolt cable, a QuickStart guide, and a USB card preloaded with all required software and user manual. Simply plug it in, install the drivers, and you're good to go. The T4's drivers have been programmed by some of the best engineers in the industry. They're specifically designed to ensure stable performance and minimal CPU overhead, allowing your computer to focus on tasks like effects processing and real-time graphic display. Built with both the studio and the road in mind, the T4 is mounted in a sturdy aluminum/acrylic chassis that can stand up to the wear and tear of an artist on the go. And because it doesn't need a power cable, it can easily be integrated into any live performance rig.